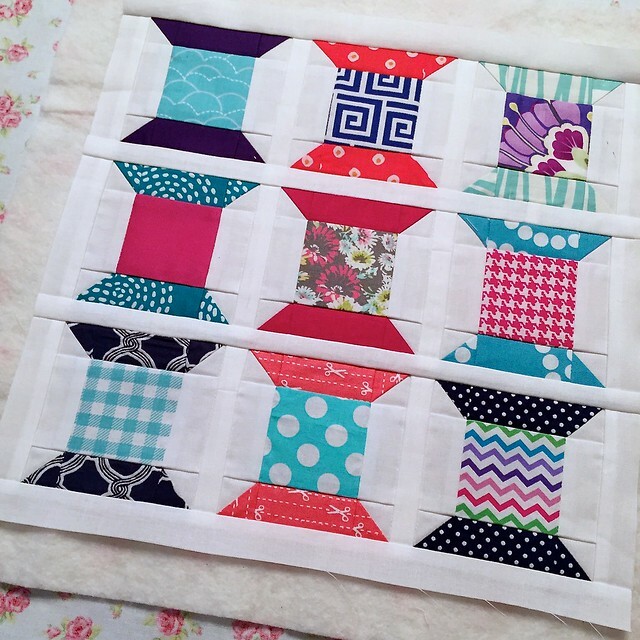 This February Sarah from Berry Barn Designs is hosting a fun challenge called the 4×7 Sewing Challenge to sew for yourself for 30 minutes each day during February. I haven’t quite made 30 minutes each day – some were more and some were less – but I like trying to sew a little each day. I’m trying to make my sewing more purposeful. As in, choose projects that I really want to finish. Finish the projects I start. Do something with the scraps or throw them away. Finally finish the quilt for my bed. That type of purposeful. I made two sets of leaders for my new velcro longer setup (which so far I am in love with, other than having to make leaders). 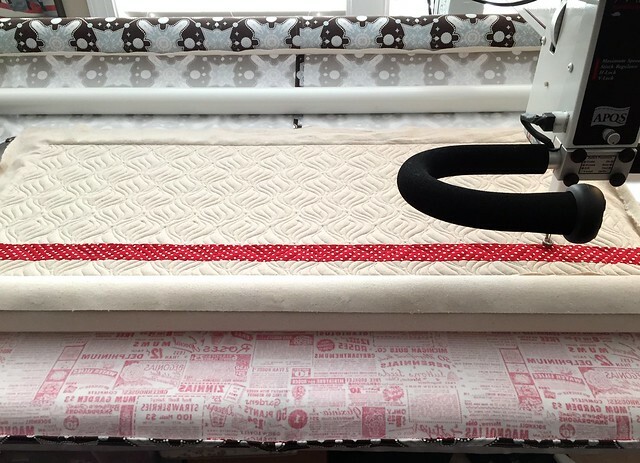 I watched Sharon Chamber’s youtube video on how she loads her quilts, and while some of it doesn’t apply because she uses a different type of machine than I do, I love her leader method. It helps me attach the quilts to achieve a flatter surface which results in a more even stitch especially at the top and bottom of the piece. It’s also easier to load because I can center the quilt easier – and if it’s off by a little, re-center much easier. You can see the newest 50″ leader in action below. I also pieced a little mini that I had started during the January meeting of the Quilting Circle I am part of. I am really trying to not create new UFO’s so I pieced the top, made a backing (even attaching a label! ), found a scrap of batting that fits, and it is in line for the longarm. 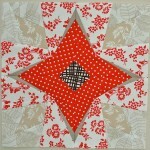 I also made another block for the “Real World Red & White” quilt. I was obsessed with that quilt last winter, and then as it warmed up my interest waned. I had though about signing up for the 4×5 block exchange on flickr this winter to get more blocks for the quilt. I did the 2014 Winter and 2014 Spring (received and sent) iterations and received some great blocks, but I have so many blocks that I want to make myself. I had to really ask myself if I was going to sign up because I wanted to do a bee, or if I wanted a forcing function to get 6 more blocks done. I really wanted a forcing function, so I’ve decided to just challenge myself to make 6 more blocks. I would like to get it done by mid-March. That’s one block a week, and seems do-able. This week I started with the Stepping Stones block from Piece n Quilt’s 30 days of blocks. Week 1 was super productive! Here’s hoping I can keep up the momentum with week 2! Sounds like you’re well on your way to meeting the February challenge. I love the idea of 30 minutes of sewing just for myself but I’m not disciplined enough. 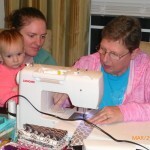 Okay, to be more accurate – I can’t hide in my sewing room that long without my 4 year old interrupting me! Looks like you had a great week! I didn’t accept the challenge but I have been trying to sew at least a little bit each day. So envious of your productivity. Everything is looking great. I’m so envious of all of you with your longarm machines! My mother had a handquilter that was sooooo frustrating she finally sold it. I know the newer generations are less frustrating. 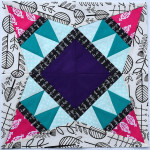 I love the pattern you’re quilting there! And the red and white square is awesome. 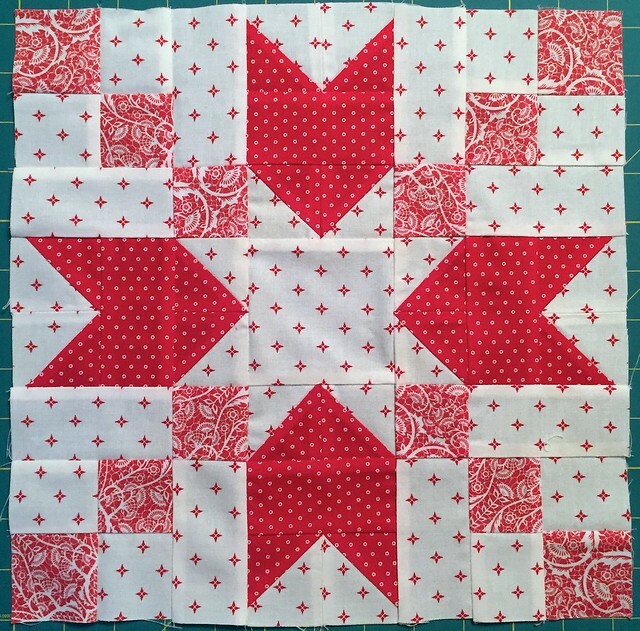 I don’t know what it is about red and white quilts that I simply love and yet, I’ve never made one! I still don’t fully understand the leaders – is it sewn to the top of the backing? Or just pinned to the leader, but the leader can be repositioned on the velcroed main leader? Regardless, I’m glad you’re finding it helpful, and I’m glad you had such a great first week! I remember your red and white blocks from last year, so I’m looking forward to seeing your finish this spring! 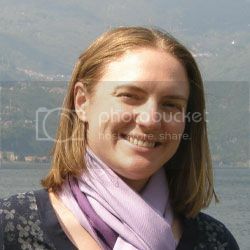 I too am trying to be purposeful (good word! ), but I still find myself drifting off on tangents. I hope your plan of six blocks by mid-March is coming along nicely. I love those fresh, bright reds.